Search for prices by set or a specific player. Prices are updated regularly by our experts. Receive a one-year subscription to PSA's print magazine, the Sports Market Report (SMR). This monthly price guide tracks market prices and provides insightful collecting commentary. 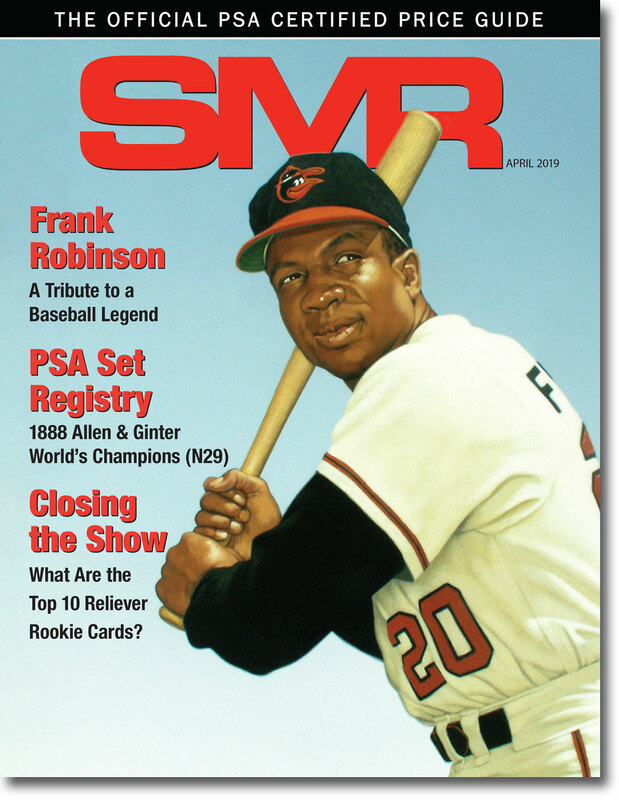 SMR Online is the only official price guide for PSA-certified collectibles and it is the most comprehensive price guide in the hobby. It includes over 400,000 prices for a host of different collectibles including, but not limited to: sports and non-sports trading cards, autographs, unopened packs, tickets, professional model bats and graded baseballs. SMR Online covers all the major sports too. Baseball, basketball, football, hockey, golf, racing and even boxing prices are here! SMR Online also covers many of the most popular non-sports issues like 1940 Gum, Inc. Superman and 1962 Topps Mars Attacks. No other price guide covers such a wide range of collectibles, from vintage legends like Babe Ruth to modern stars like Derek Jeter. A Note About Sportscard Pricing. * Editor's note: plus (+) beside a price indicates that the price has increased in the past month. A minus (-) beside the price indicates that price has decreased in the past month. Prices listed in the SMR Online are based on PSA-certified/graded collectibles. The clear benefit of having your items certified by PSA is because, generally speaking, items certified by PSA tend to sell for more - sometimes significantly more - than those that are not. Read more about what PSA can do for your collection. Every issue contains card prices based on established price histories. No subjective pricing surveys or price ranges of ungraded cards are ever included. This means that our prices more accurately reflect what you will realize when you sell or buy PSA graded sports cards. In addition, important notes about the collectibles are listed throughout the online reference, often at the bottom of each specific category. This includes notable sales at public auction. Follow PSA’s step-by-step guide for determining the value of your cards. Low Population Cards and "Commons"
Scarcity, within different grades, can impact the value of a card significantly. The prices listed in the SMR Online do not always reflect the potential premium associated with a particular "Low Pop" card. In particular, when viewing the general "commons" pricing, keep in mind that the price listed is an approximate value of a card with average population attributes. Expect to pay a premium for any card that may be a condition-rarity or low population card relative to the issue. The print version of the Sports Market Report delivers current market prices and expert commentary to your home on a monthly basis. Learn how you can receive the SMR printed price guide each month.